New for February 2014: we have more information on an alternative to the "Sharkbite mitre". New for February 2011! We have some content on the equivalent electrical length of mitered bends in microstrip, thanks to Kevin, who introduced us to the "sharkbite mitre"! Here we will review some ways to minimize the effects of bends in transmission lines, by mitering or curving transmission lines. What's the best way to bend a microstrip or stripline transmission line? There is no one single answer, and this causes a lot of disagreements at design reviews. In truth, it isn't the big deal that some engineers make it out to be, if you understand the two problems that bends create. The first problem is that the discontinuity changes the line characteristic impedance, without compensation the bend adds shunt capacitance. But in reality the small capacitance that is usually a result doesn't change the circuit's performance very much. The other problem associated with bends is can cause far more damage to the intended performance of a highly tuned circuit: the effective length of the transmission line becomes shorter than the centerline length. Electromagnetic waves like to take shortcuts! 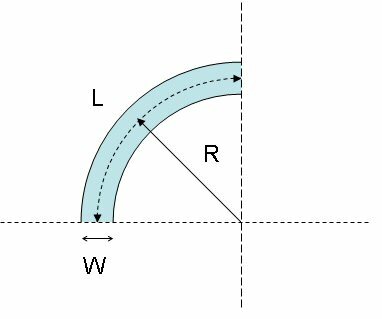 Example 1: if you use a curved bend of ninety degrees, the effective length of the line is approximately the centerline length minus w/4. 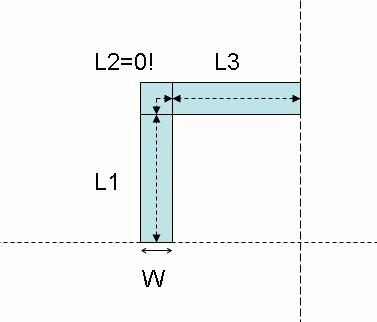 Example 2: to model the length through a corner bend, simply ignore the length of L2. Sorry, we have little experience with the length calculation of mitered bends, so we're not going out on a limb and claim this rule of thumb works in that case! Why don't we have experience here? Because we almost never bother to use them! But wait, we have a new rule of thumb for the case of mitered bends, see below. If you use a radius greater than three times the line width, you will have a transmission line that is almost indistinguishable in impedance characteristics from a straight section. Before we continue, let's review the many ways the word "miter" (or "mitre") is (are) used. In the good old U.S. we prefer the "miter" spelling, in the more ancient tea-sipping, bowler-wearing U.K. they use "mitre". In both cases, if you look up the definition in a dictionary, you will see only two meanings, neither of which is what microwave engineers are talking about when they say "mitered bends". Miter can mean the ridiculous fishhead-shaped hat that a bishop wears (think about a chess set), or the manner in which two rectangular pieces of material (boards, tiles, shingles, etc.) are beveled so they can be joined together to create an angle with no gaps. That being said, pay attention below to see how we use the word, and maybe someday this use will be added to the dictionary where it belongs. Note that what started out as an adjective (mitered bend) is now an accepted (at least in the microwave community) noun. When you make a ninety degree bend in a transmission line you add a small amount of capacitance. "Mitering" the bend chops off some capacitance, restoring the line back to it's original characteristic impedance. The image below shows the important parameters of a mitered bend. R.J.P. Douville and D.S. James, Experimental Characterization of Microstrip Bends and Their Frequency Dependent Behavior, 1973 IEEE Conference Digest, October 1973, pp. 24-25. R.J.P. Douville and D.S. James, Experimental Study of Symmetric Microstrip Bends and Their Compensation, IEEE Transactions on Microwave Theory and Techniques, Vol. MTT-26, March 1978, pp. 175-181. There's a spreadsheet in our download area that does this math for you, go check it out! Our spreadsheet download does all of this for you, and even makes a plot of the results. Here's an example for H=10, W=10. The higher the W/H ratio, the more drastic the miter becomes. The following was supplied by Kevin in February 2011... many thanks! 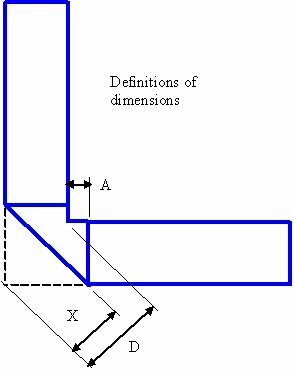 I noticed that you had a statement on the "mitered_bends" page: "Sorry, we have little experience with the length calculation of mitered bends, so we're not going out on a limb and claim this rule of thumb works in that case! Why don't we have experience here? Because we almost never bother to use them!" Well, I am designing a very small module where board space is at a premium, so I don't want to use big gradual curves to avoid using miters. I also was interested in the precise delay through a miter. So I whipped up a Sonnet simulation and found something interesting that I thought you might want to share with your readers! 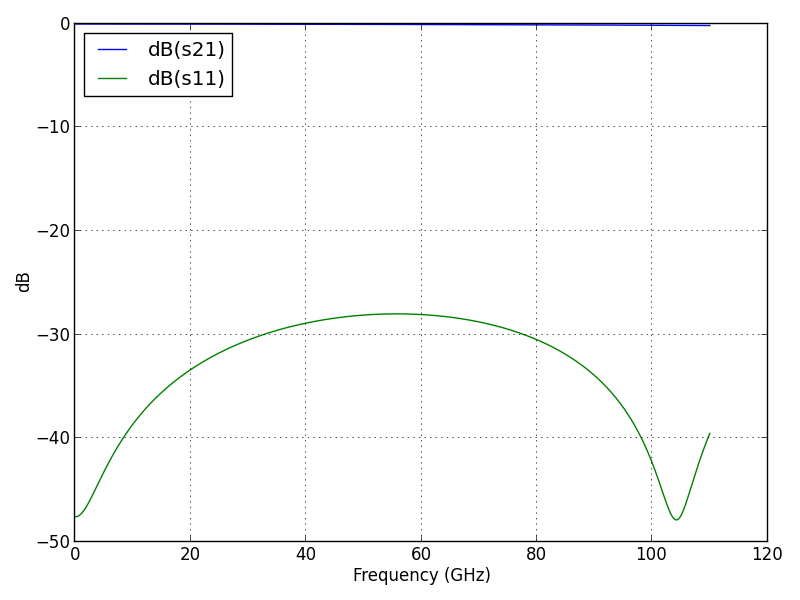 I used the Rogers propagation simulator to estimate the delay of a similarly sized (straight) microstrip. 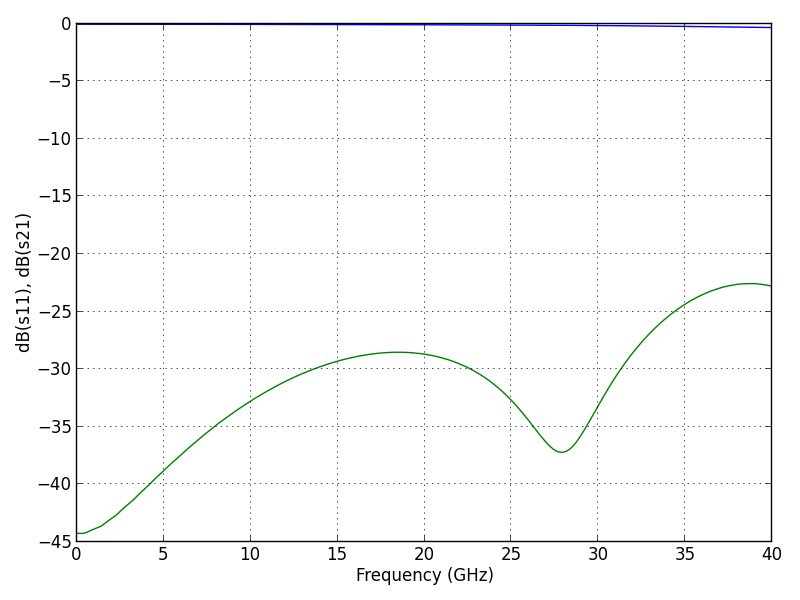 I adjusted the length in the Rogers simulator until the phase delay equaled the phase delay observed in the Sonnet simulation. The excess delay beyond the inside corner path length is conveniently almost exactly equal to half the width of the trace. 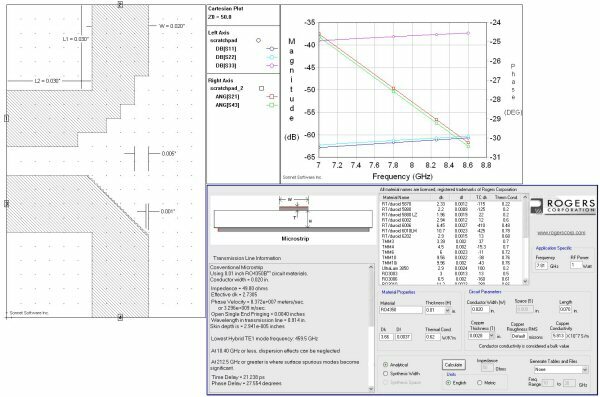 From the above simulation, it appears that both the classic and sharkbite miters cause an extra delay equal to W/2 (W is the trace width), so the total effective path length is L1+L2+W/2. The excess delay beyond the inside corner path length is conveniently almost exactly equal to half the width of the trace. An alternaitive sharkbite miter... and a free EM tool! This came from Darrell in January 2014... also thanks! I came to your site to get the mitered bend formulas, saw the sharkbite miter and decided to try simplifying it even further. I was surprised how well simply taking a square out of the corner worked. That makes it easy to simulate as well as get into a PCB without doing the whole DXF import thing. I did later find that with thinner dielectrics the remaining width in the corner gets too small for the usual PCB design rules and ended up going with the regular miter. I actually wrote a script that builds the OpenEMS model and creates a PCB footprint file avoiding the DXF conversion. I am a former HFSS user, but have not wanted to put out that much cash since starting out on my own. OpenEMS is a plug-in for Matlab and you build models by writing Matlab scripts with commands like AddBox, AddCylinder and AddPolygon. That is a bit painful for a new user but I now find it faster to work with than the HFSS modeler. The port implementation is somewhat lacking, and the absorbing boundaries aren't quite right. 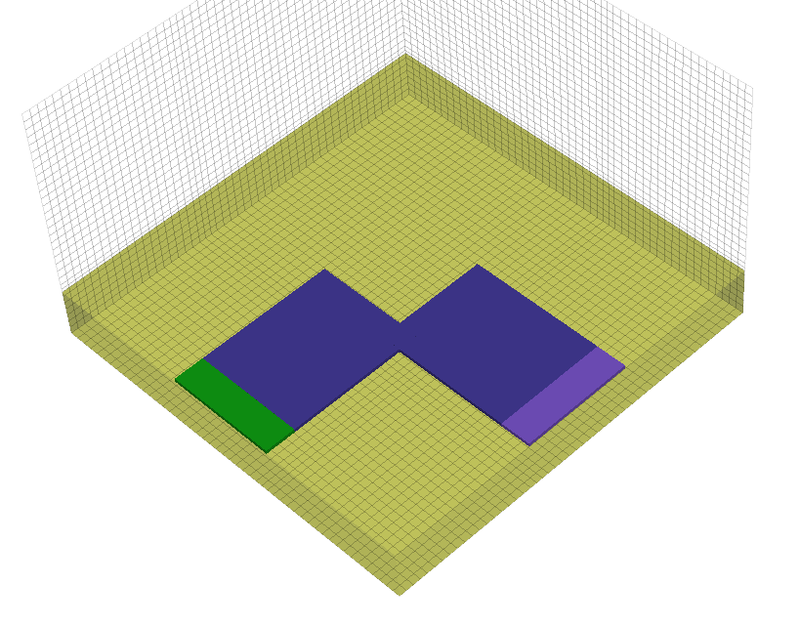 Here's an image of the square corner, for reference, drawn in OpenEMS. 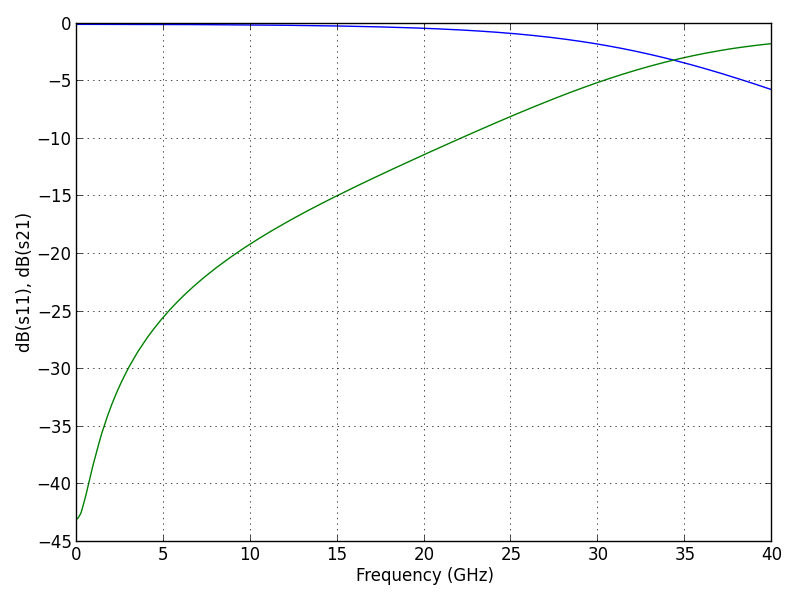 In this case and the next case, ER=3, H=20 mils (508um), and the straight fifty ohm line is 1.1mm wide. For reference, here is what a square corner looks like (assuming ER=3, H=20 mils). Blue is S21 and green is S11. 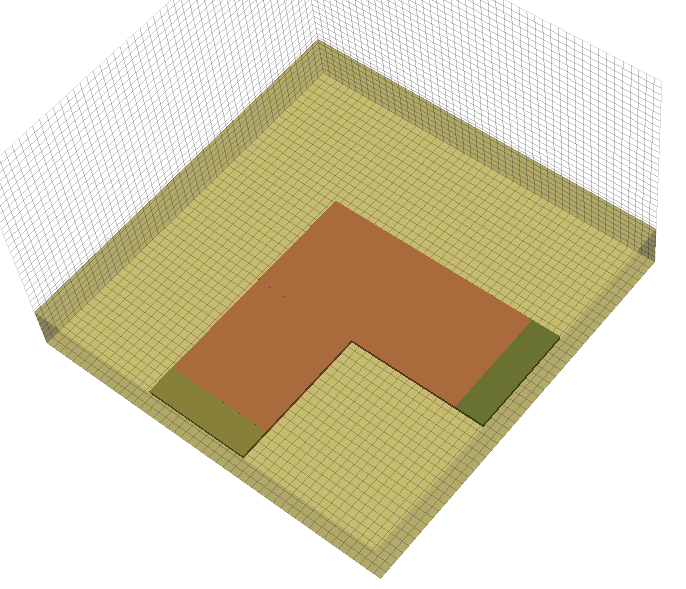 The line is 1.1 mm wide; the square removed is 0.9 mm. Just for fun, I dropped it to a 5 mil substrate and it does work decently at 110 GHz. Of course, it's not readily manufacturable with that tiny corner. Thin film on quartz, perhaps. Harlan Howe, Jr. Stripline Circuit Design, Artech House Inc., 1982. G. Matthaei, L. Young and E.M.T. Jones, Microwave Filters, Impedance-Matching Networks and Coupling Structures, Artech House, 1080, pp. 203, 206.